I'm in The Weekly Yelp for Los Angeles! Well, my Kosher List is, anyways. And I think that's pretty cool, considering not long ago I blog-vented about how slow Yelp was in getting a Kosher category up on their site and it took a lot of nudging from me. I must say, Yelp is turning a new leaf. I think they're also trying to tell me something. Strangely, I now feel like the Kosher Yelp Advisor with all this Kosher glory. Next thing you know, I'll be opening a Kosher restaurant on Pico Blvd. and inviting the Yelp Elite to eat at my place free of charge so they'll feel obligated to write nice reviews, which won't be necessary since my place will rock all on its own. Anyways, The Weekly Yelp is Yelp's newsletter that arrives to my inbox every Tuesday (but can also be found archived on their site so I can revisit the articles later), and one of the sections is called Fresh Lists. Here's this week's, and the fourth one down is from yours truly. In case you can't make out that ridiculous thumbnail next to the Kosher list mention, I've done you the favor of blowing it up and placing it at the top of this post. 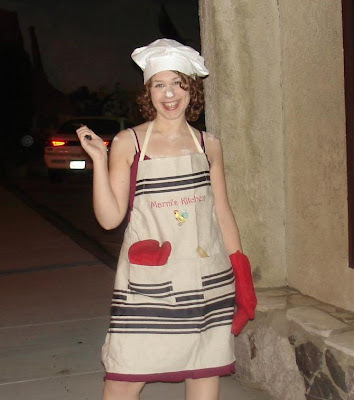 Yes, that's me in my personalized apron and flour dusted nose one fun Halloween a couple years ago. Yelp and their weekly newsletter rocks! That's awesome that they just added more kosher support. justin - it was about dang time! catch my impatient tone? chuck - you're right, norcal is insufficiently kosher. oy gevalt!